The song from Mumford & Sons called Dust Bowl Dance is as pertinent to today as it was in describing the Great Depression. I was taken by the lyrics and the rage in the song. The setting for the song is the Dust Bowl of the 1930?s in the US Midwest. Picture the Joads in Grapes of Wrath. As I listened to the song again this morning I was struck by the similarities between the time period described in the song and our present situation. The lyrics by Marcus Mumford tell the story of a young man who’s lost everything. His family is either dead or forced off their land. My interpretation of the lyrics is that the bank has foreclosed on his farm after their crops failed during the dust bowl. I picture a Mr. Potter like character who held the mortgages on all the farms and houses in a small community. The evil banker didn’t care that families had lived on this land for decades, raising their families along with the crops. These hard working farmers had done nothing wrong. They were victims of circumstances. But bankers didn’t care about ruining lives. The family farmers didn’t participate in the Roaring 20?s, borrow on margin to invest in stocks, or reap ungodly profits. The farmers were victims of land speculators and bad weather. The only son in the song took the law into his own hand and shot the evil banker. He was ready to do his time, because his act was righteous payback. Eighty years ago the last Fourth Turning was also in its infancy. They generally last 15 to 20 years. The catalyst for the last Fourth Turning was the great stock market crash of 1929. The 1920s “boom” enriched only a fraction of the American people. Earnings for farmers and industrial workers stagnated or fell. Farmers were barely getting by during the roaring 20s. Only the Wall Street crowd was getting rich. The economic growth of the 1920s did not reach most Americans: 60% of American families earned less than the amount necessary to support their basic needs ($2,500 was considered enough to support a family’s basic needs). The agricultural sector was similarly stagnant: farm prices dropped after World War I when Europe again began to feed itself and new grain exports from South American further depressed prices. The lack of purchasing power of rural people and farmers resulted in declines in consumer purchasing in those areas, as well as increased defaults on debt. Rural, urban, and suburban consumers began to increase their personal debts through mortgages, car loans, and installment plans to buy consumer goods, such as radios. The ever-growing price for stocks was, in part, the result of greater wealth concentration within the investor class. Eventually the Wall Street stock exchange began to take on a dangerous aura of invincibility, leading investors to ignore less optimistic indicators in the economy. Over-investment and speculating (gambling) in stocks further inflated their prices, contributing to the illusion of a robust economy. The crucial point came in the 1920s when banks began to loan money to stock-buyers since stocks were the hottest commodity in the marketplace. Wall Street banks encouraged Wall Street investors to use the stocks themselves as collateral. When stocks dropped in value, and investors could not repay the banks, the banks were left holding near-worthless collateral. Banks went broke, pulling productive businesses down with them as they called in loans and foreclosed mortgages in a desperate attempt to stay afloat. The Federal Reserve was responsible for regulating the banks. They were responsible for the easy money policies during the 1920s. The biggest financial institutions in the country included: Citibank, Bank of America, Goldman Sachs, JP Morgan & Co., Chase National Bank, and Wells Fargo. Sound familiar? The Great Depression was caused by the Federal Reserve and their owners, the biggest Wall Street banks, aiding and abetting reckless speculation, greed and extreme risk taking with mountains of debt. The rich got richer and the poor got poorer. The income inequality in the U.S. reached an all-time peak in 1928. It stayed at a high level until World War II. The glory years of the American Empire were from 1941 through 1979, when the middle class was growing, and the income distribution in the country was fair and equitable, as our manufacturing based economy raised all boats. The 2008 financial crash was caused by loose Federal Reserve monetary policies, lack of Federal Reserve regulation over criminally reckless Wall Street banks, and incredible levels of bad debt rampant throughout our economic system. The true unemployment rate today is 23%. Another parallel between the early 1930s and today can be seen in the chart below. 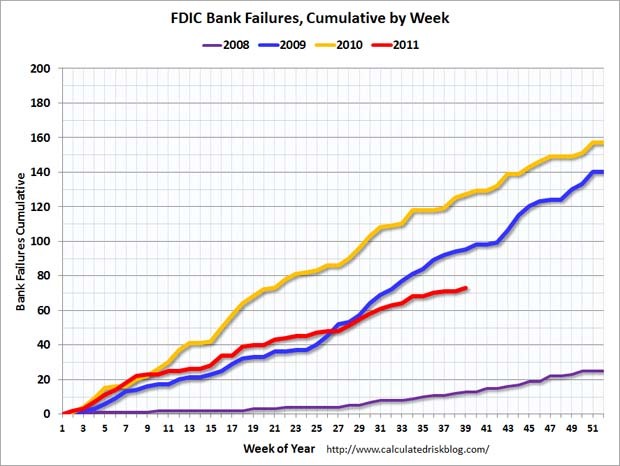 Almost 11,000 banks, or 40% of all the banks in the U.S., went out of business. Predictably, these were all small banks. None of the connected Wall Street banks went out of business. They benefitted, as 40% of their competition disappeared. Too Big to Fail existed 80 years ago. You may also note that savers were punished, as interest paid on savings plunged from 5% to below 1% and the earnings of middle class workers collapsed. Historical Statistics of the United States, pp. 235, 263, 1001, and 1007. During the early years of the current depression more than 400 banks have gone insolvent and another 800 banks are on the FDIC endangered species list. Therefore, approximately 15% of all the banks in the U.S. will no longer compete with the Wall Street banks that caused the financial crisis. Since 2008, the top five biggest banks in the U.S. have dramatically increased their market share and power. They are: Bank of America, JP Morgan Chase, Citigroup, Wells Fargo, and Goldman Sachs. Amazing how the exact same banks that caused the 1929 and the 2008 market crashes came out unscathed and more powerful after each crisis. The mainstream media tries to convince the American public that the stock market going up means the economy is improving and they are doing better. The chart below shows that the stock market bottomed in 1932 and proceeded to go up almost 500% by 1937. It’s too bad only the bankers and richest people in society could afford to own stocks. While the stock market soared, the average person struggled to survive. Only the privileged stock owners prospered. The common man suffered. The unemployment rate remained at elevated levels until World War II. The New Deal policies of Franklin Roosevelt did not end the Great Depression. The common man had trouble putting bread on their table during the entire decade of the 1930?s. The storyline about FDR’s Keynesian spending ending the Depression is false. The 1930s were filled with seething anger. The Liberty League and Father Charles Coughlin, the Rush Limbaugh of his time, used anti-communist and socialist rhetoric to convince millions of Americans that the model used in Nazi Germany was better than FDR’s New Deal policies. This pushed Roosevelt further to the left against big business and toward more socialist programs to insure getting the votes of the poor. These were bleak days in our country’s history. General Smedley Butler revealed a plot to overthrow the Roosevelt administration and replace it with a fascist dictatorship. The country roiled with furious rage. In 1932, approximately 80 years ago, 43,000 marchers (17,000 veterans) descended upon Washington D.C. The Bonus Expeditionary Force, also known as the “Bonus Army”, marched on Washington to advocate the passage of the “soldier’s bonus” for service during World War I. They set up a camp with tents to bring attention to their cause. After Congress adjourned, bonus marchers remained in the city and became unruly. On July 28, 1932, two bonus marchers were shot by police, causing the entire mob to become hostile and riotous. The government turned the U.S. military upon its citizens. Army cavalry units led by General Douglas MacArthur dispersed the Bonus Army by riding through it and using gas. Fifty five veterans were injured and 135 were arrested. Critics of the marchers described them as communists, troublemakers, and criminals. Fast forward 80 years and we have protestors setting up camp in a public square, not far from where the same exact banks that caused the Great Depression have created the Greater Depression. The biggest Wall Street banks have gotten bigger. The Federal Reserve, in collusion with the Wall Street banks, has engineered a two year stock market rally, while the average American has seen their wages decline, food and energy prices soar, home prices fall, and banks paying them .1% on their savings. Anger and disillusionment continue to build in this country like a volcano preparing to blow. Some people are angry at Washington politicians. Some are angry at Wall Street. Others aren’t sure who to be angry at. The evil oligarchy of bankers, corporate titans, and bought off Washington politicians that control the agenda and mainstream media, continue to scorn, ridicule and denigrate the middle class of America. Their financial engineering is failing. They’ve gone too far. The debt accumulation is unsustainable. The mood of the country has darkened and talk of revolution and the shadow of impending violence is growing. The Great Depression was not an event, it was an era. It was an era of discontent, pain, suffering, and ultimately war and death. The people who lived through this era have mostly died off. We have entered a new similar era. The average citizen sees the American Dream of a better life slipping away due to the corruption, greed, and immorality of our political and financial systems. The Federal Reserve’s current chosen mandate is to make the stock market go up, while impoverishing the middle class. The 1% better hope the police and military continue to obey their orders, because the 99% are angry and heavily armed. This Fourth Turning has ten to fifteen years to go. Every previous Fourth Turning has included violence, war and death on an epic scale. Winter has arrived and it will be a long arduous journey until we reach Spring. The choices we make in the next few years will decide the fate of our country. I hope we choose wisely.